We're big into Legos at our house. Like entire-afternoons-spent-rebuilding-sets-that-have-been-taken-apart-rather-than-doing-the-dishes big. Yep, some things are just more fun than doing the dishes...even when you're an adult. Last Christmas, Noah found a great deal on two sets of bricks (one Lego and one Duplo) and picked them up for Abe. We gave him the Duplos for Chrismas, but held onto the Legos since he was still a bit young for them at the time. This year I used that set of Legos to make some ornaments to put in our advent calendar. In addition to the holiday themed ornaments, I also made a few of Abe's favorite animals. The animals went in the advent calendar too but I didn't put a string on them. They'd be pretty cute hanging on the tree though! 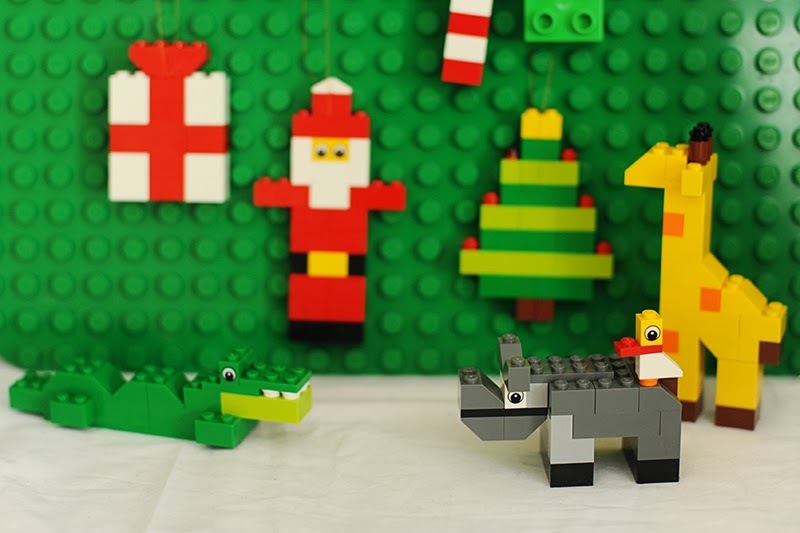 You can find the instructions for the crocodile, rhino, and giraffe at LEGO.com. For the rest of the ornaments just collect the bricks listed below and assemble the pieces as shown in the picture (click on it for a better view). I'm listing the bricks that I was able to find in the set I used, but obviously you can replace 2 1x2 bricks with 1 1x4 brick, or use different colors or whatever makes it easier. 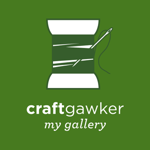 To hang them, just slip a piece of string under one of the bricks and tie the ends together. 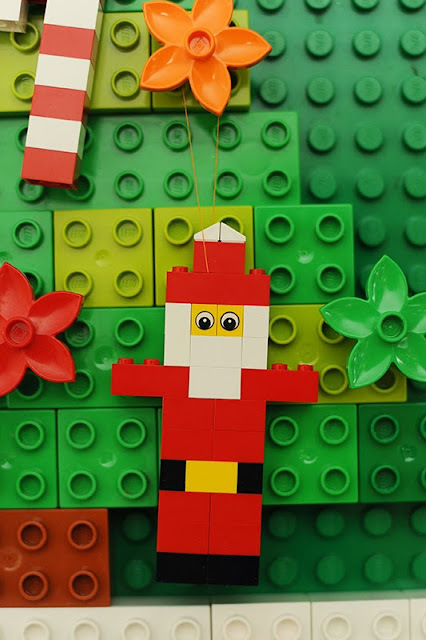 For Santa, you'll need 1 black 1x4, 9 red 1x2 bricks, 2 black 1x1 bricks, 1 yellow 1x2, 2 red 1x3 bricks, 2 white 2x2 bricks, 4 white 1x1 bricks, 2 yellow 1x1 bricks with eyes, 1 red 1x4, and 2 white 1x1 triangles (for the top of his hat). 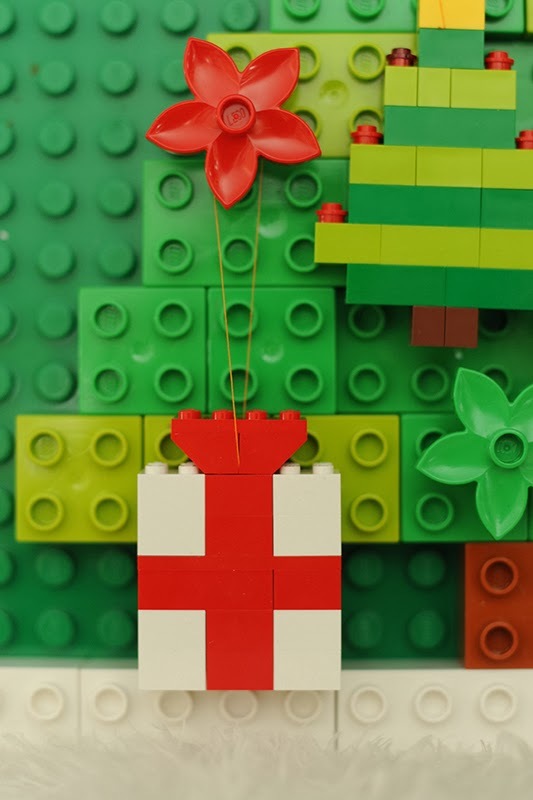 For the present, you'll need 8 white 2x2 bricks (or any other color for the "paper") and 5 red 2x2 bricks, 1 red 2x4, 1 red 2x6 plate for the "ribbon", and 1 red 2x4 plate and 2 red 2x2 inverted slopes for the "bow." 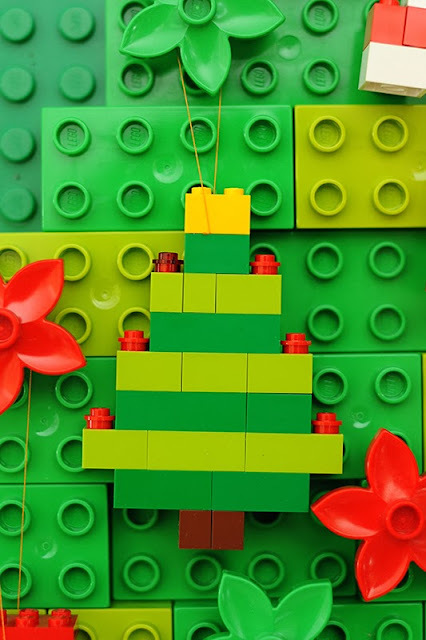 For the tree, you'll need 2 brown 1x1 bricks, 2 dark green 1x3 bricks, 2 dark green 1x4 bricks, 2 dark green 1x2 bricks, 2 light green 1x3 bricks, 5 light green 1x2 bricks, 2 light green 1x1 bricks, 1 yellow 1x2, and 6 red 1x1 circles. I could only find 5 solid colored red circles in the set I used, so I used one transparent red piece for the last "ornament." 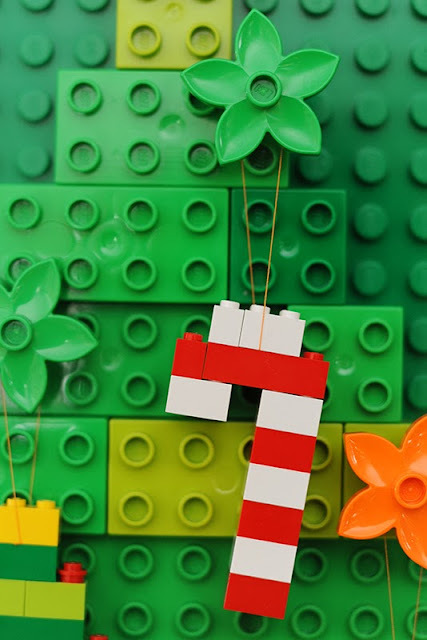 For the candy cane, you'll need 5 white 2x2 bricks, 1 white 1x2, 3 red 2x2 bricks, 1 red 2x4, and 1 red 1x2. 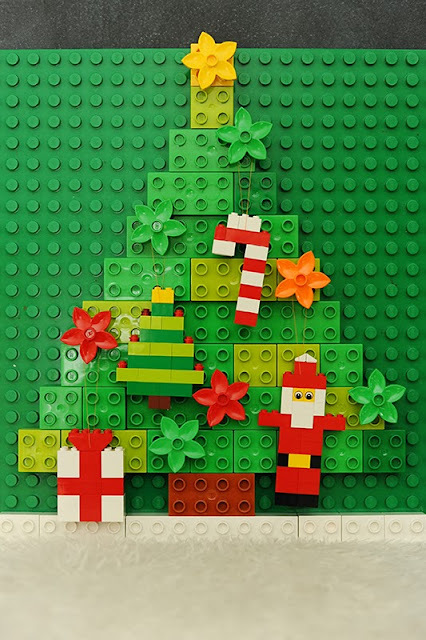 Have fun building...and don't forget you can find more DIY ornaments right here! LOVE this! Thank you for the instructions. Our Elf on a Shelf made this last night! Love these! We've done candy canes and christmas trees before, but never made it much beyond those...thanks for the instructions!